Stochastic model checking is a recent extension of traditional model-checking techniques for the integrated analysis of both qualitative and quantitative system properties. 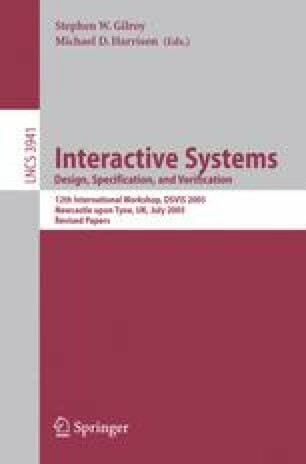 In this paper we show how stochastic model checking can be conveniently used to address a number of usability concerns that involve quantitative aspects of a user interface for the industrial groupware system thinkteam. thinkteam is a ready-to-use Product Data Management application developed by think3. It allows enterprises to capture, organise, automate, and share engineering product information and it is an example of an asynchronous and dispersed groupware system. Several aspects of the functional correctness, such as concurrency aspects and awareness aspects, of the groupware protocol underlying thinkteam and of its planned publish/subscribe notification service have been addressed in previous work by means of a traditional model-checking approach. In this paper we investigate the trade-off between two different design options for granting users access to files in the database: a retrial approach and a waiting-list approach and show how stochastic model checking can be used for such analyses. This work has been partially funded by the EU project AGILE (IST-2001-32747). For further details, the reader is referred to the technical report of this paper .